It says doctors should talk to people who could die within 12 months, who may be frail or terminally ill, and give them choices over their future care. But the report says that rarely happens and doctors should be more proactive. It recommends involving family, friends and carers in the conversation too. The report, Talking about dying, gathered the views of patients, trainees and doctors on how to begin conversations about the end of someone's life. Although doctors say they find these types of conversations challenging, the report said it was important they didn't "shy away" from them. It said doctors in all areas of healthcare should engage with a patient who wanted to talk about dying. But it shouldn't be "a one-off, tick-box event". Linda Magistris set up a charity called the Good Grief Trust after her husband died from cancer. She says she was shocked by the way he was told the end was close. "They literally just said you've got weeks to live, and, sadly, it was done in an environment that wasn't private. "There were five people around the bed, pagers were going off at the same time - it was very chaotic. "That was a private moment and a really significant moment for him and it should have been done more sensitively." One in three adults admitted to hospital with a serious illness or injury and 80% of care home residents are estimated to be in their last year of life. 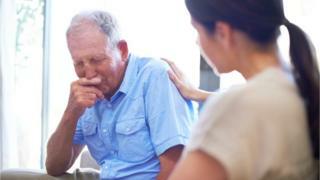 But only a quarter of patients in these categories are given the chance to discuss the end of their life with a doctor, the report says, and those with heart failure, dementia and frailty are much less likely to be identified. Nearly half of all deaths in England happen in hospital - and 25% of people who die there have been in hospital for more than a month. But surveys suggest hospitals are where communication about the end of life is poorest. The report suggests junior doctors don't get enough hands-on training talking about dying with real patients. Dr Victoria Tzortziou Brown, from the Royal College of GPs, said patients should feel reassured that GPs were "highly-trained to have sensitive conversations" with them and their families. She said: "The entire relationship between GP and patient is based on good communication, and we have a unique role in the NHS of caring for our patients from when they are born to the end of their lives. "We are pleased that the report highlights this and hope it will help GPs and other healthcare professionals with their conversations on these important issues." Prof Andrew Goddard, president of the Royal College of Physicians London, said: "This is not just about palliative care in the final days but about having a series of conversations much earlier after a terminal diagnosis." Prof Dame Jane Dacre, the previous president of the RCP, said: "Patients value and benefit from clear conversations about the end of life. "These conversations are difficult, but we need to get better at having difficult conversations."